It may not feel like much of a winter wonderland in Tucson, but the University of Arizona was no doubt a Wildcat Wonderland during the final week of the semester. Finals Survival Week, a campus-wide effort dedicated to supporting students during an often stressful time, took on a winter theme in December of 2017 – and the Office of Global Initiatives was there to provide some international fun. Hundreds of students gathered across campus to recalibrate before their big exams. Activities ran the gamut, from zip-lining at the UA Challenge Course, to a late-night pancake breakfast at the Student Union Memorial Center. And one would be remiss to neglect to mention the ever-popular Therapy Dogs on the UA Mall! 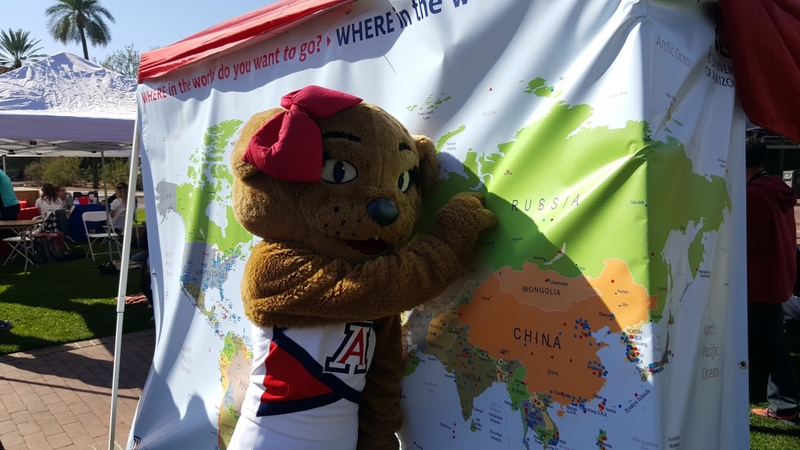 The Office of Global Initiatives was on hand to admire the puppies, and to provide study abroad advice to students, as well as a map where people pinpointed where they want to travel – including Wilma who wants to visit Russia! The Confucius Institute of the UA also presented traditional Chinese painting. From the Office of Global Initiatives, good luck with finals and we hope you have a restful break!